I have some NOS from WW2. PM if you still need some. Eastman A-2 manual lists only Crown for the Dubow 20960. If it is impossible for you to find one without having to take a second mortgage on your home, then you may have to go with Talon. I have a Goodwear Dubow 20960 with a Talon zipper, and it is not a replacement. John would be the man with the answers to your dilemma. I sent several PM to JC of Goodwear (buzzthetower) last week and also sent two E-Mails to info@goodwearleather.com, but since then always nobody replied me, is it normal for JC? thank god, he wrote me back!!! So, what did he write? I believe Buzz Rickson makes a repro Crown chevron zipper, and licenses it to ELC (or maybe it's the other way 'round). From what I know, neither BR nor ELC will sell a repro Crown zip by itself. So, you're probably out of luck. The only workaround I can see is buying an ELC or BR A-2 with a Crown zip, buy a (repro) Talon or other A-2 zip, have a tailor swap out the zips on the ELC/BR A-2, and then sell the ELC/BR A-2 (disclosing, of course, that the zip has been replaced). Then you have your repro Crown. Byzantine, I know, but I don't see a feasible alternative, unless you want to spend the time and money to track down an original NOS Crown chevron, which don't exactly grow on trees. thanks for your Suggestion! I got confirmation from ELC, that they replace the Zipper for their customers only for ELC manufactured jackets, not for other jackets. And ELC doesn't sell their Repro Crown seperately. Actually I wanna replace the Zipper with a vintage NOS Crown Chevron from 40s' on my Goodwear Dubow 20960, but right now I changed my mind, i'm gonna use repro Crown, because I'v heard that the NOS Chrown tape is too weak, although they are new, but NOS Crown slider is much stronger. So, what does Goodwear tell you? That would seem the easiest route to go. not that special, just about general Information for repro/NOS crown Zippers. I'm wainting for his next reply about the cost of Zipper replacement. Here is the current YKK Zipper on my Goodwear Dubow 20960. 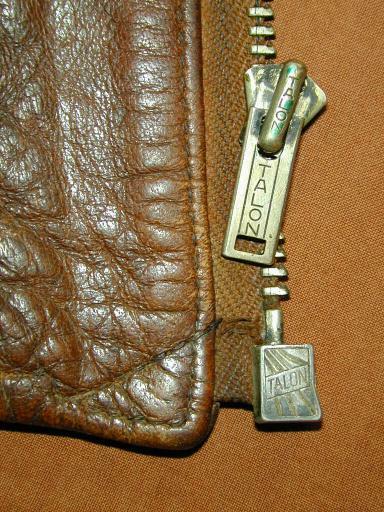 The original Crown Zipper was broken and replaced by 1st owner. I have to say, this UGLY YKK slider slides so smoothly than any Repro WWII Zippers. 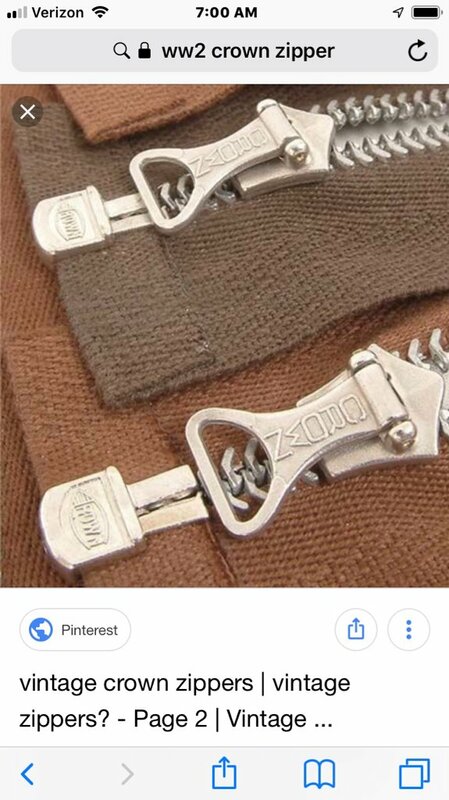 Yes, YKK zips are looked down on but they do work. Riri are the best of all IMO and are a smooth as a baby's bottom. I've had repro Crown zips on Eastman's and thought them a bit fragile. I've still got one of the aluminium ones on an Eastman C2 and that needs very careful handling. I don't trust it at all. you're right, maybe I should keep this YKK Zipper on my jacket, because I don't need worry about it. The YKK zipper box kind of looks like a Crown,,, same basic shape I mean my be try to find a Crown pull on slap it on . PM me if interested , happy to sell one of these.